Normally, I'd avoid a novel about a 78-year-old woman like, well, a real-life 78-year-old woman in a grocery store line. But a novel about a 78-year-old woman written by Jonathan Evison? I'm all in! And this is great. Harriet Chance has lived a long and fruitful life, and soon after Bernard, her husband of fifty-plus years, dies, she learns he'd won an Alaska cruise, which he'd never collected, at a silent auction. She decides YOLO, and goes, even after her friend Mildred bails on her, and her two grown (and scheming) children, Skip and Caroline, try to talk her out of it. 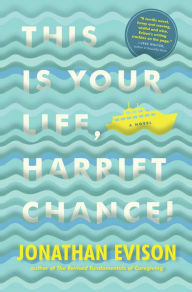 Along the way, though, we delve back into Harriet's life in short snippets of story (told in the style of the radio program "This Is Your Life"; "Look at you Harriet, a grown woman! ", i.e.) that show her at various formative stages. All this gives context for the real-time action, and the revelation of a secret about Bernard that Harriet discovers not long after she's embarked on the cruise. It's a secret that changes everything...dum dum dum. But the intriguing thing here is that we soon learn that Harriet harbors her own skeleton(s), and isn't completely blameless. Evison's revelations are carefully placed and tug us along through the narrative at just the perfect times. It's a near-perfectly constructed novel, is what I'm saying. One of my favorite parts of this novel is how it subtly scolds readers for our (or maybe just my?) stereotypes of and annoyances with the elderly. Indeed, there's even a scene, at a time in the novel when we're at maximum sads for Harriet, when she struggles with her coupons in the grocery store, and the line behind her gets impatient. I'm not going to lie, I was a little ashamed of myself when I read that part. Overall, though, this is quick, charming, delightful, if often sad, read. As was the case with The Revised Fundamentals of Caregiving, Evison's terrific 2012 novel (soon to be a movie with Paul Rudd, by the way), Evison is fantastic at somehow making his readers happy while reading a sad story. You'll read this quickly, and if you're like me, you'll really dig it.